Hospitality management company offering training and consulting services to hospitality professionals in restaurant, lodging or food and beverage operation. Offers online training courses in Responsible Service of Alcohol and Food Hygiene needed to work in the hospitality industry in Australia. Training programs, seminars, consulting, operations manuals and mystery calls for hospitality businesses, including reservations, sales, food and beverage, customer service and management development. Canadian broker servicing the food service, prison, and hospitality marketplaces. Co-operative of USA and Australian, Canadian, Japanese, Mexican, and Caribbean food and non food distributors to the hospitality industry. Provides food and beverage photography and graphic design services for the hospitality and food and beverage industry. Singapore. Rent, try, or buy equipment for food and hospitality industry. Recruiting for temporary and permanent hospitality jobs throughout the US. Provides services to the food and hospitality industry. Includes client list. Supplier of frozen prepared meats and finger food products to the hospitality industry. Speaks to the restaurant and hospitality industry on leadership, food safety and customer service. Implementation of cost-benefit systems for the food and hospitality industry. Offering education in the hospitality industry, BSc in international hospitality administration, and BA in international culinary administration based in India with Swiss affiliations. Specializes in the placement of middle to upper management in the U.S. hospitality and food industries. Specializing in recruiting professionals at all levels for the US hospitality and food service industries. International recruiter specializing in the food, beverage and hospitality industries since 1977. Manufacturer of quality brushes for the janitorial, hospitality, food service and construction industries. Sales Through distributors. Distributor of commercial ice machines, refrigerators and related products to the food service, hospitality and health care industries. On-line educational web based training platform for food brokers, manufacturers, distributors, and chefs in the hospitality industry. Manufacturer of contract, commercial furniture for the hospitality and food services industries, chairs, barstools, tables, booths and banquettes. Training program on introduction to food and beverage service, accredited by Australian Hospitality Review Panel. Specializes in food and beverage services and assists restaurant and hotels with new menu development, management training, and ownership transition. Providing food safety research, training and certification, with project details and FAQ. St Paul, Minnesota, USA. Provides architectural, interior design, building, hospitality and food service industries photography. Toronto, Ontario, Canada. International recruiter specializing in the food, beverage and hospitality industries since 1977, located in Marietta, Georgia. Manufactures and distributes aprons, chef coats, servewear, bedding, towels and table linens for the food service and hospitality industries. Provides food and hospitality management services to companies, public agencies, schools, health care institutions, and retirement communities. Focusing on development and improvement of businesses in the catering, food service and hospitality industries - based in Victoria, Australia. Provider of restaurant POS solutions for the food service and hospitality industries. Retail touch screen hardware platform. If the business hours of Cambridge School of Culinary Arts in may vary on holidays like Valentine’s Day, Washington’s Birthday, St. Patrick’s Day, Easter, Easter eve and Mother’s day. We display standard opening hours and price ranges in our profile site. We recommend to check out cambridgeculinary.com for further information. 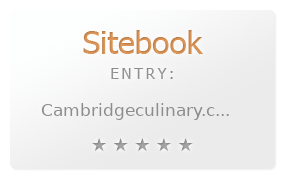 You can also search for Alternatives for cambridgeculinary.com on our Review Site Sitebook.org All trademarks are the property of their respective owners. If we should delete this entry, please send us a short E-Mail.